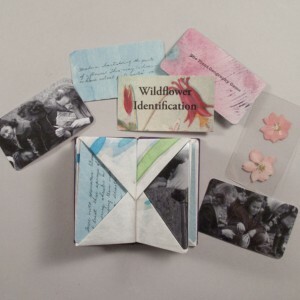 Wildflower Identification (blizzard book edition made in 2013; edition sold out). The submission deadline is Monday, December 17, 2018. Full details are here. The prospectus is here. This exhibition is open to those working in the book form worldwide who are at least 18 years of age. 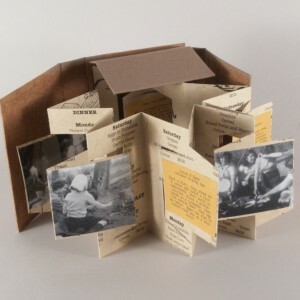 Eligible are any artist book works created using structures found in The Art of the Fold by Hedi Kyle & Ulla Warchol. Books may be editioned or unique, sculptural or more traditionally bound, interactive or passive. Books that measure more than 14 inches (closed) in any dimension are ineligible. Unframed wall works with maximum dimension of 24 inches in any direction, and weighing less than 20# are eligible. Please note that the works needn’t be recent because some of us have been working with these structures for a while. Campfire Cookery (panorama book edition also from 2013; edition sold out).